It has become more and more common for big tentpole movies to feature trailers that include shots that ultimately aren't used in the final cut, and the blockbuster Star Wars spin-off Rogue One: A Star Wars Story is no different. 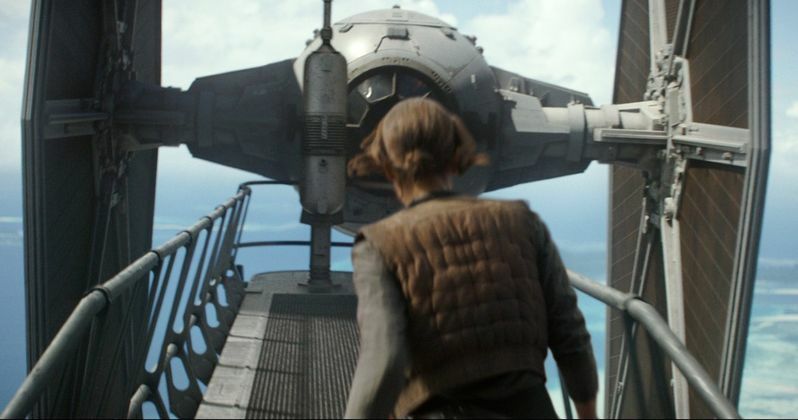 There were a number of shots seen in various trailers, including one where a lone Jyn Erso squares off against TIE Fighter, and an alternate version of the climactic Scarif battle scene, that never made it into the movie, although many assumed they'd be able to see them in the deleted scenes when the DVD and Blu-ray arrived. However, when the Rogue One special features were announced in February, there was no mention of deleted scenes, which certainly upset some fans. Now director Gareth Edwards has explained why these deleted scenes won't be found on the special features, and it turns out there's a very good reason for their exclusion. While the Rogue One Blu-ray includes several behind-the-scenes featurettes, which offers fans new insight into how the story was crafted from an idea by ILM's John Knoll, along with featurettes focusing on all of the main characters and even a segment featuring Easter Eggs and references to other Star Wars movies, many fans were hoping for deleted scenes. During a new interview with Fandango, Gareth Edwards revealed that there are no deleted scenes, because nothing that was cut from the movie was an actual full scene, just tiny tidbits of much bigger scenes. Here's what he had to say below. "There's not an individual scene that you can drag and drop and put on a Blu-ray. There are little things that would come and go during the process of post-production, but they're not scenes. They're more moments within the scenes, or a single shot. So it's impossible to be able to do that, and that's why the decision was made. The stuff people talk about, like what they saw in the trailer, they're not scenes you can just put on a DVD. They're moments within scenes and threads, and you pull a thread and it all changes. It was changing the whole time. It's not like there was one version and then there was this other version, it was like this thing that incrementally evolved constantly through all of post-production and didn't stop until there was a gun at our heads and we were forced to release the movie." One of these scenes was an alternate version of the Scarif battle, where these Rebel soldiers are seen running across the beach, with the Death Star plans in hand. Gareth Edwards revealed that particular scene never made it into the cut simply because the visual effects were never finished. Here's what he had to say below. "The visual effects were never finished on (the alternate versions of the Scarif battle). It's not like there's something sitting somewhere. I feel like making a film is like a sport where someone blows a whistle and that's it, the score is what it is. And the goal is to win. If I could go back and do the film knowing what I know now, the final film would be completely different. I'd probably be willing to make Star Wars for the next ten years and never let go of it, constantly trying to finesse and find new ideas. But at some point it stops, and it is the movie. The film that got released, I feel like that is the film, and everything else is just the process of making it." When asked specifically about the Jyn Erso scene where she faces a massive TIE Fighter, the director revealed that the marketing department got a bit too excited about that shot. While he doesn't offer any context about the shot, he revealed the shot will remain a "myth." Here's what he had to say about that particular moment below. "Yeah, [that shot is] going to have to remain a myth because it's sort of the thing where you're trying ideas out to find the right version of the movie, and at the same time marketing is getting excited about certain shots and moments. Eventually you'll see something presented to you and you'll be like, wait a minute, this shot is no longer in the film." Regardless of what was left out and what made it in the film, Rogue One: A Star Wars Story was certainly successful, both critically (85% Fresh on Rotten Tomatoes) and commercially ($530.1 million domestic, $1.05 billion worldwide). While there won't be any deleted scenes, there will be plenty of new behind-the-scenes footage for fans to enjoy. Rogue One: A Star Wars Story debuts on Digital HD March 24, before arriving on Blu-ray and DVD April 4.